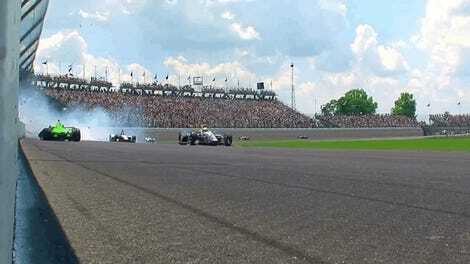 The “greatest spectacle in racing” just one-upped itself in one pit stop. The No. 26 pit stall and car of Zach Veach burst into flames after a fueling mishap during today’s Indianapolis 500, but his crew yelled at him to drive off anyway. Fortunately, the wind blowing over his car put out the flames in no time. Speed is good, friends! Just look at this insane pit stop. The dry break system for their fueling rig—meant to only have a couple drops when released instead of the little trickle you see in the video above—clearly isn’t working right. 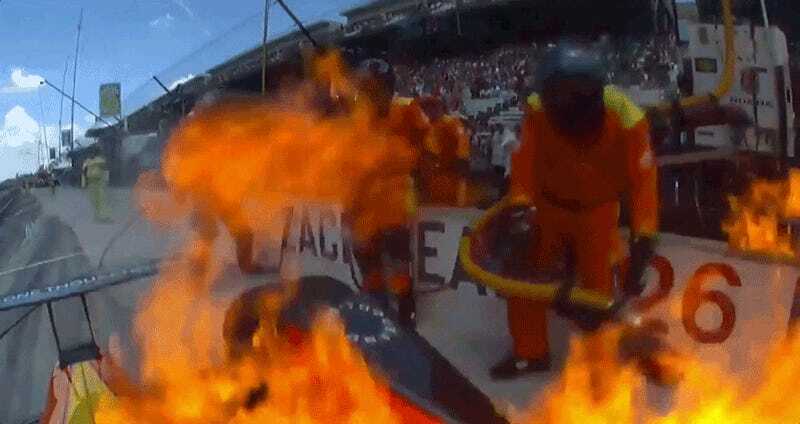 That much fuel combined with the hot components of an IndyCar that’s been in use for a large chunk of the Indy 500 resulted in a big ol’ fire in Veach’s pit stall, which they couldnt’ quite get the extinguisher on in time. Someone in the next pit stall tried to throw a bucket of water at the car, but it felt like it was in vain. This dry-break issue has been a problem again for Veach as he cycled through the pits for fuel, but this time they totally hosed down the side of his car down with water to prevent another big flare-up. Hopefully they can figure out a way not to set Veach’s car on fire at all, but I have to say that “drive away fast” seemed to work pretty well.